Although self-driving cars have yet to move out of the testing phase, automobile companies are already looking towards the future — when we’ll have self-flying drone taxis with detachable pod compartments! The Pop.Up.Next consists of an autonomous, wheeled, battery-electric chassis that holds a detachable, two-seat pod designed by Italdesign and Audi. When it’s time to fly, a flight module designed by Airbus lands, straddling the pod. The chassis raises the pod until the pod locks onto the flight module, then the flight module takes off for the destination. There, the four-propeller module straddles another chassis upon landing, lowers the pod onto the chassis, and the chassis departs on the road. That’s all great, but you need to watch the promotional video. 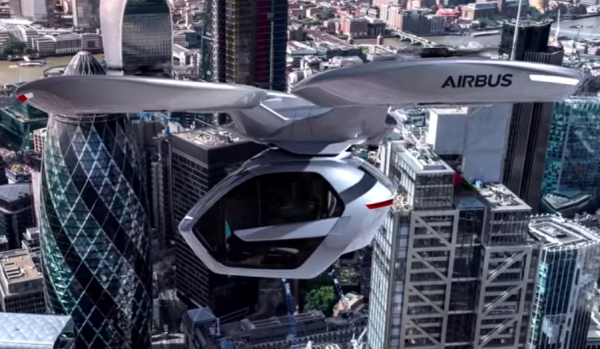 It includes some truly terrible CGI (because remember, this thing doesn’t exist yet) as well as the suggestion that if you are cool and rich enough to ride in a detachable pod carried by a four-propeller drone, attractive female joggers might watch you from a distance. Last week, I crossed the sunny street, got in to the backseat of a Waymo minivan loaded with far more computing power than an early-’90s supercomputer, and hit a big blue button marked start ride in English and braille. There was a guy in the front seat, young and ponytailed, but he did nothing but go along for the ride, hands off the wheel. The car took off down the street, destined for a strip-mall bar called the Priceless Prime Time, one of a handful of destinations that Waymo allowed us to go to as part of a press preview of the technology. It got to a stop sign at Arizona Avenue, the name for busy Highway 87, which pulled this town into existence as a crossroads outside a still-tiny Phoenix. Traffic surged past us, and the car waited patiently—maybe a hair too patiently—and then pulled out and merged with the stream of dumb machines heading north. Waymo’s minders did not allow me to take the car to a busy parking lot, but one local, Jim Guccione (yes, he is related to the Penthouse publisher), told me that’s where they really struggle. “They get confused a lot in parking lots,” he said. We’ve clearly got a long way to go before we get to the self-flying drone taxi phase, even though Audi hopes to release its Pop.Up Next within a decade. Photo credit: Pop.Up Next promotional video screenshot.